In an electric circuit containing an AC power supply together with inductive coils , capacitors and resistors , the AC current would be opposed by reactance ( inductive reactance or capacitive reactance ) in addition to the resistance of resistors and wires , The resistance and reactance together are called impedance and given the symbol ( Z ) and measured in Ohm ( Ω ) . The impedance ( Z ) is the equivalent to the resistance , capacitive reactance and inductive reactance together in an AC circuit , When the impedance of RLC circuit = 300 Ω , It means that the total opposition to the electric current in this circuit due to the resistance and the reactance of both the coil and capacitor = 300 Ω . It is almost impossible practically to construct an inductive coil with zero resistance , because any coil must have a resistance due to the wires used in its fabrication . 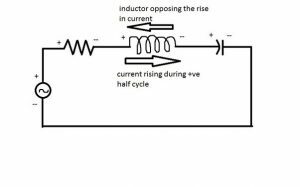 When electric circuit contains inductive coil , ohmic resistance and AC source connected in series , we noticed that the current passing through each of the resistance and the induction coil is the same in value and phase since they are connected in series . But voltage in the coil ( VL) leads current ( I ) by ¼ cycle ( phase angle 90° ) in the induction coil , voltage in the resistance ( VR ) is in phase with current ( I ) in ohmic resistance . The potential difference across a coil ( VL) leads the potential difference across the resistance ( VR ) by a phase angle 90° , thus the total potential difference is out of phase with the current intensity ( I ) . When electric circuit contains capacitor , ohmic resistance and AC source connected in series , We notice that the current passing through each of the resistance and the capacitor is the same in value and phase since they are connected in series . But voltage in the capacitor ( VC ) lags current ( I ) by ¼ cycle ( phase angle 90° ) in the capacitor , Voltage in the resistance ( VR ) is in phase with current ( I ) in ohmic resistance . The potential difference across the capacitor ( VC ) lags the potential difference across the resistance ( VR ) by phase angle 90° , thus the total potential difference ( V ) is out of phase with current intensity ( I ) . The negative sign means that the potential difference ( VC ) lags the potential difference ( VR ) by an angle 90° . In the induction coil , voltage ( VL ) leads current ( I ) by phase angle 90° . In the ohmic resistance , voltage ( VR) is in phase with current ( I ) . In the capacitor , voltage ( Vc ) lags current ( I ) by phase angle 90° . The coil voltage ( VL ) leads the resistance voltage ( VR ) by angle 90° and the capacitor voltage ( Vc ) lags the resistance voltage ( VR ) by angle 90° and thus the phase difference between ( VL ) and ( Vc ) is 180° . VL > VC , XL > XC , The phase angle ( θ ) is positive , the total voltage ( V ) leads the current ( I ) by angle ( θ ) , That means inductive circuit behavior . VL = VC , XL = XC , The phase angle ( θ ) equals zero , the total voltage ( V ) is in phase with the current ( I ) , That means ohmic resistance behavior . VL < VC , XL < XC , The phase angle ( θ ) is negative , the total voltage ( V ) lags the current ( I ) by angle ( θ ) , That means capacitive circuit behavior . The real consumed power ( Pw ) in AC circuit , either RL , RC or RLC is only the power that consumed in the ohmic resistance in the form of heat energy .